Pharmacy Purchasing & Products may collect and use personally identifiable information of individuals for purposes of supporting Pharmacy Purchasing & Products programs, services or operations. Pharmacy Purchasing & Products reserves the right to use this information to contact a user of this site ("User") regarding account status, changes to the Policies, or other matters relevant to the Sites or the information collected. 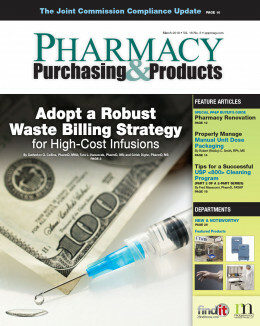 Pharmacy Purchasing & Products may at times provide aggregated information to third party entities conducting commercial or philanthropic activities approved and sponsored by Pharmacy Purchasing & Products. Any personally identifiable data that is shared is limited to that which can be found on a standard mailing list and only to those parties www&period;pppmag&period;com considers relevant to our users. When a User subscribes to an email list or provides an email address for other purposes, the subscriber's email address is recorded and used for future Pharmacy Purchasing & Products email distributions. The address may also be used for general Pharmacy Purchasing & Products email announcements. A subscriber's email address will never be disclosed to a third-party entity external to Pharmacy Purchasing & Products. Pharmacy Purchasing & Products may disclose to third party entities certain aggregate information or related data. This information may include personally identifying information where specifically authorized by you or in the good faith belief that the disclosure is reasonably necessary to comply with the law or legal process, to enforce these Site Policies and/or the Terms & Conditions of Use for related online services, or to protect the personal and informational safety of users or the public in exigent circumstances. This information may also be released as necessary to protect the rights or property of Pharmacy Purchasing & Products or as Pharmacy Purchasing & Products determines is reasonably necessary to maintain or efficiently operate online services. To access information that the www&period;pppmag&period;com site may have stored, please visit our “Privacy Center” here. Non-personal information and data may be automatically collected with "cookies" through the standard use of the Site. Cookies are small text files employed by various web sites to recognize repeat users, facilitate ongoing site access and usage, track usage behavior and compile aggregate data to allow content improvements and targeted advertising. No usage behavior from www&period;pppmag&period;com, outside of the aggregate, will be shared with any third party without user permission. The Site may be linked to other sites or resources that are not maintained by Pharmacy Purchasing & Products. In addition, Pharmacy Purchasing & Products may sometimes permit third party entities to offer subscription and/or registration-based services through the Site. Pharmacy Purchasing & Products provides these site links only as a convenience to our visitors. The inclusion of any link does not imply an endorsement by Pharmacy Purchasing & Products of any of the policies of the other sites, nor does Pharmacy Purchasing & Products assume any liability for the actions, content or privacy policies of any linked sites.